The back grab handle on my Futaba T8FG annoys me due to its size. Most other transmitter brands have a shorter handle making the transmitter more compact. I decided to remove mine which is fairly simple to do. On the back of the transmitter are 5 cross head bolts to remove. Once done you can simply pull the rear panel off which isn't attached to anything. The handle is held to the rear case panel by a 2.5mm Alan key slotted bolt. The bolt thread diameter is just 2mm so once you remove the handle simply use a single 2mm nut back on the original posts and tighten it up. 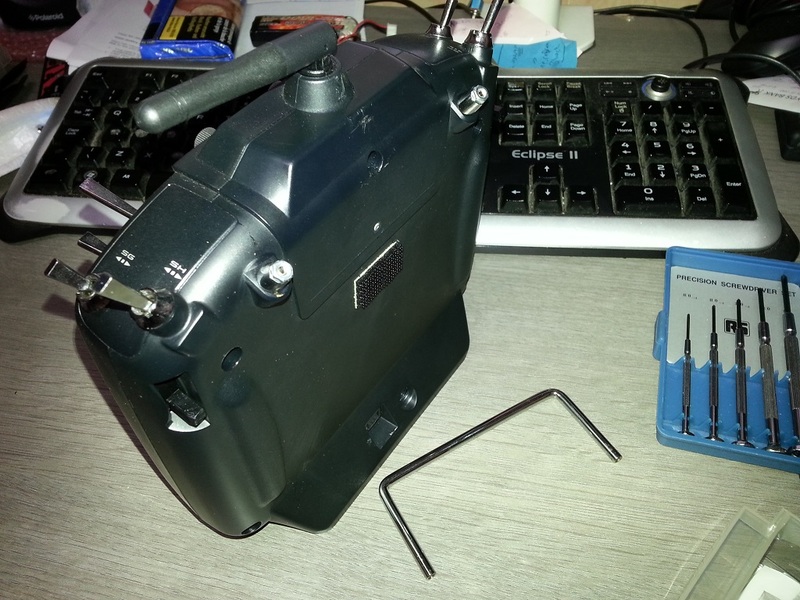 When done the transmitter still doesn't make contact with the surface but the transmitter overall is way more compact! Image resized, click here to see fullsize.